← The Owlery- Round 2! I’ve been hankerin’ for some Indian food lately. So when I finally had a chance to go grocery shopping last night, I put the rest of my plans for the night (including sketches) on hold and created a beautiful, Indian masterpiece inspired by this recipe from Serious Eats. In a heavy bottomed stockpot, heat oil over medium-high heat. Add onion, garlic, ginger, and chili pepper. Cook for about 10 minutes, until pepper is tender. Add cayenne, cashews, and 1/2 a Tablespoon curry powder. Cook until fragrant. Remove from eat and add coconut milk. Transfer mixture to a food processor and blend until smooth. Return mixture to pot. Add chickpeas, spinach, and remaining curry powder. Cook for 10 minutes over low heat, stirring frequently. Spinach should be wilted and chickpeas should be tender. Transfer to serving bowl and top with cilantro to taste. 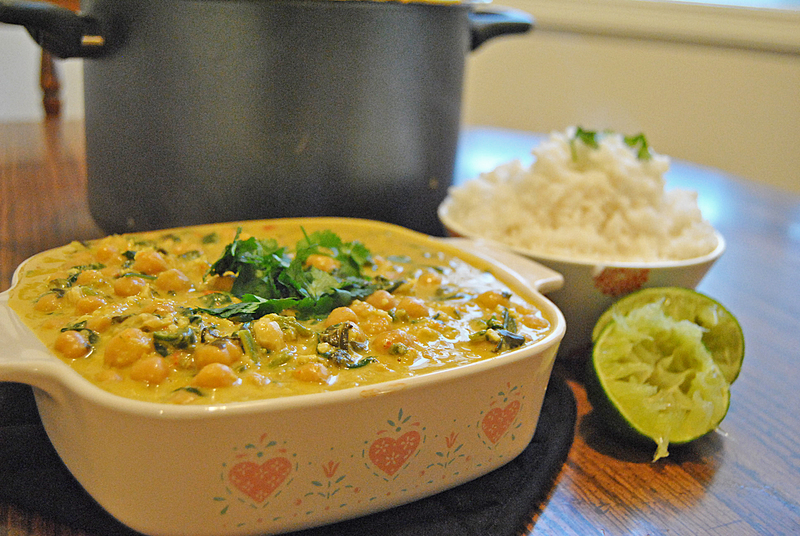 This recipe definitely satisfied my Indian craving and on a budget. I had cashews on hand (which seemed to be the most expensive thing on the list) so I really didn’t have to buy anything except coconut milk. Tomorrow is Pieday Friday! How excited are you?! I personally love a good palak paneer. Paneer is sooooo good. Thanks so much. 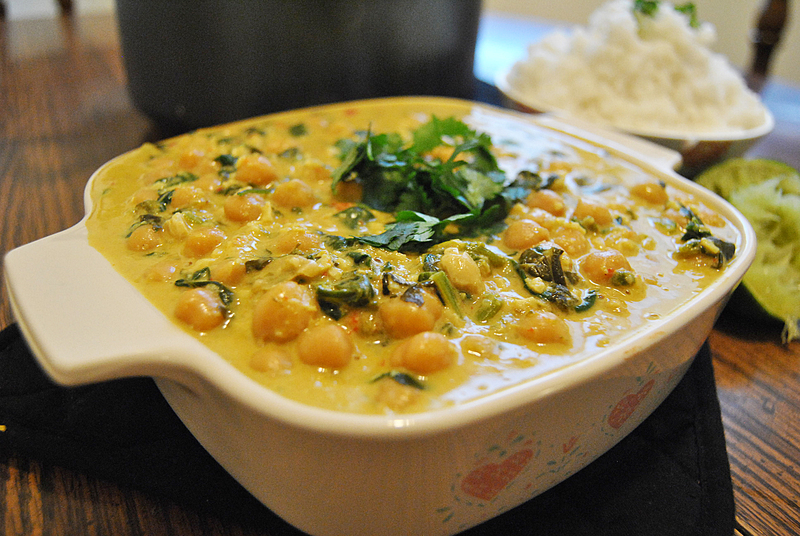 I’ve been craving Indian lately too, and now I can take care of that with a new dish…. yum. This sounds delicious!! And I have been craving Indian flavors lately as well!! I’m going to be honest, I’m never NOT craving Indian flavors. Yum! Yum, this sounds so good. I have all of these ingredients at home already too… definitely hope to try it soon!